After we explored Luncheon of the Boating Party through Shel Silverstein’s We’re Out of Paint, So . 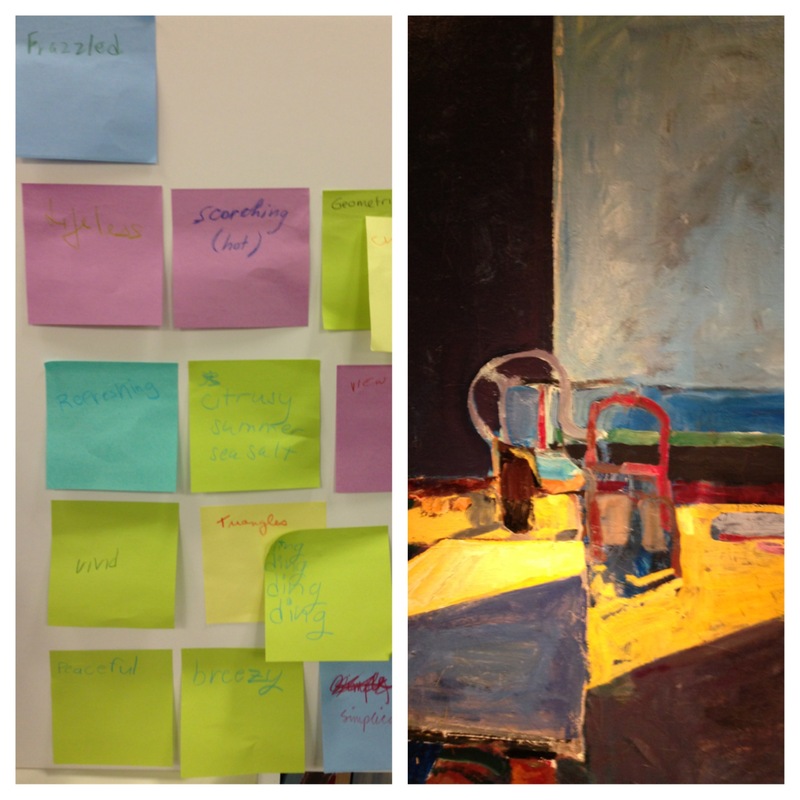 . . , poetry tour participants looked closely at Richard Diebenkorn’s Interior with View of the Ocean. Together, we create a group Post-it poem to capture the essence of the painting. To start off, each person wrote down one word on a Post-it note. Together we grouped and organized the verbs, nouns, and adjectives and then regrouped them according to their mood. We started with a phrase that conveyed a negative mood and then moved to the more positive words. Vivid triangles: DING DING DING DING! Richard Diebenkorn, Berkeley No. 1, 1953. Oil on canvas, 60 1/4 x 52 3/4 in. Gift of Mr. and Mrs. Gifford Phillips, 1977. The Phillips Collection, Washington D.C.
-Gifford Phillips in an oral history interview (March 4, 2004) speaking of the first Diebenkorn painting he and his wife Joann gave to The Phillips Collection. Gifford Phillips was Duncan Phillips’s nephew, son of Duncan’s beloved brother James. Gifford was a passionate champion of the arts, discerning collector of both contemporary painting and historic Native American work, and dedicated political activist. He died on Wednesday of natural causes at the age of 94. Read about his contributions to art, politics, and publishing in today’s Los Angeles Times.